The second of those is, to my mind, an improvement on the first, not least because (as Marx didn’t quite say) the goal is not simply to understand the world, but to change it. But it still strongly implies that the process is linear and that data exists independently of the insight and action we want to develop. A moment’s thought makes clear that the world doesn’t really work that way: without a framework for understanding the knowledge-wisdom/insight-action end of the process, there is no such thing as data, which is why it should not be surprising that when we change our desired insight or our intended action, the data and information needed to help us navigate proves simply not to exist (or not to be collected, organised and managed, which in practice comes to the same thing). Some alternative ways of thinking about this come from the same sources which lie behind my post a few weeks ago on the three generations of knowledge management. (and yes, the reference is to that Poindexter, but that’s by the by). One step on from that is the OODA loop invented by the US military – observe, orient, decide, act. But as the picture shows, the complexity of the feedback system and the components of orientation are considerably richer. 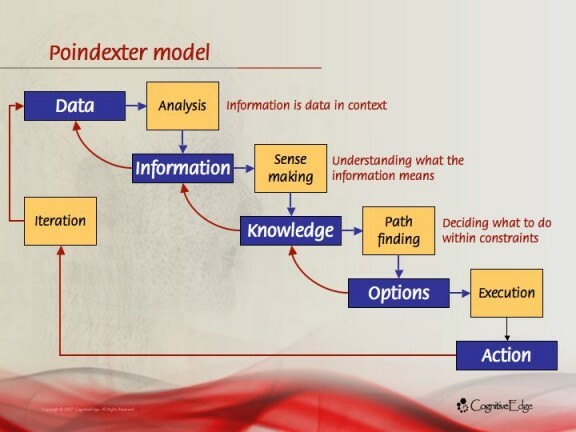 I have also had my hair-pulling rants about the data-information-knowledge step model, mostly because it assumes (or seems to represent) that data is a primitive of information is a primitive of knowledge. Naturalistically speaking, it seems to me that data is information that is purposefully decomposed for a variety of information and knowledge-driven manipulations ie it’s a sophisticated knowledge artefact. Data doesn’t exist in the wild. Information is knowledge that is filtered and abstracted from specific contexts to make it communicable – ie so that it can be liberated from the specific and can persist across time and space. Of course, within society and organisations we don’t start from a primitive state. We have a whole lot of baggage made up of the interplay of information and knowledge mostly, with occasional injections of data depending on our jobs. However, I just don’t get the linearity bit in this model or ones like it. I just don’t experience linear DIK progressions and I rarely see anyone else work that way. I might want to compile data on something. My purpose in doing so starts from a context of having knowledge and some knowledge objectives. I know I’ve got access to various information resources. So I’ll analyse what my data model needs to be either implicitly or explicitly. This is now a knowledge artefact, which sets up the specifications for the data I will pull from information available to me. I plough through my information sources or other data sources available to me to compile data into my model. I’ll play with it – using my knowledge – to generate new knowledge and probably some information to communicate to other people. Knowledge, information and data are all interacting with each other – indeed, feeding off each other. Now I agree that options, pathfinding and action are healthier extensions of the model than wisdom or intelligence are , but I just don’t see how the message of linear “progression” between elements, or the “A is a building block of B is a building block of C” can help anyone relate to knowledge and information use in the real world. effective analysis and decision making is not and cannot be a linear process: data needs to be based on intended action as much as action needs to be based on data.